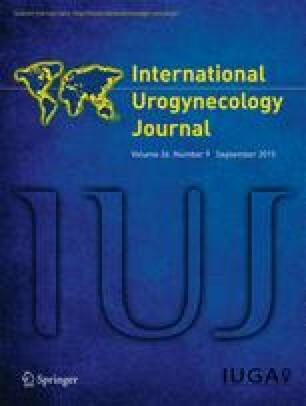 Does anesthetic method influence vaginal bulge symptoms and patient satisfaction after vaginal wall repair surgery? Surgery for pelvic organ prolapse (POP) under local anesthesia has been advocated for several reasons such as lower costs and application in multimorbid patients. The aim of this study was to investigate how the anesthetic method influences the rate of recurrent prolapse and patient satisfaction with POP surgery. In this retrospective study 4,936 women operated for single-compartment prolapse between 2006 and 2011 were included from the Swedish National Register for Gynecological Surgery. The feeling of vaginal bulge 1 year after surgery indicated presence of recurrent prolapse. Multivariate logistic regression analyses were used to identify independent factors affecting the outcomes, presented as adjusted odds ratios (aOR) with 95 % confidence interval (CI). After surgery for single-compartment prolapse patients with cystocele were at a higher risk of feeling a vaginal bulge than patients with rectocele (1.62, CI 1.28–2.06). Applied anesthesia was no independent predictor of bulge symptoms in the cystocele/rectocele population. In the cystocele group local anesthesia compared with general or regional anesthesia implied an increased risk of vaginal bulge symptoms (1.32, CI 1.03–1.68) as well as POP-Q-stage III–IV (1.30, CI 1.09–1.55), and a higher BMI class (1.22, CI 1.03–1.46), while a higher age class decreased the risk (0.79, CI 0.70–0.89). Choice of anesthesia had no impact on bulge symptoms in the rectocele group and no influence on patient satisfaction in any of the groups. Patients operated for cystocele under local anesthesia were at a higher risk of experiencing vaginal bulge symptoms 1 year after surgery compared with general or regional anesthesia. We would like to thank Mattias Molin and Nils-Gunnar Pehrsson for statistical advice and Emil Nüssler for providing data from the Swedish National Register for Gynecological Surgery. Sponsors: the Swedish Government, the Swedish Society, and the Federation of Swedish County Councils. J. Pong: project development, data collection and management, data analysis, manuscript writing and editing; K. Stenström Bohlin: project development, manuscript writing and editing; C. Pedroletti: project development, manuscript writing and editing; A. Strandell: project development, data analysis, manuscript writing and editing.